…four days of hard work! Here at ely we have always placed a huge importance on staff knowledge, be it menu items, food provenance, local knowledge, or most importantly, wine knowledge. With that in mind, we sent three of our staff –myself included- off to the Rhone Valley for four days of hard work! The idea was to meet the producers that we have been working with over the last few years, and introduce ourselves to some new ones. It was also an opportunity to taste the last several vintages and get a better understanding of each. We were joined on our trip by the one-and–only Simon Tyrrell, a man with an almost obscene knowledge of both the Northern and Southern Rhone regions and producers, and who quickly earned the title ‘Professor Tyrrell’. After a 4.30am start and quick flight to Marseille, we headed north to Avignon, in the heart of the Southern Rhone. The first thing you notice is the wind – Le Mistral – the famous wind which blows through the valley for 120 days of the year. There is no escaping it, and it lends the vineyards a slightly wind-blown appearance. But more importantly, it keeps the vines clean, cool and free of disease. Our first visit was to Les Vignerons D’Estezargues, a fantastically forward thinking and dynamic Co-op. Composed of just ten growers, all practising natural winemaking and with a definite focus on quality, this Co-op differs from most in that each grower vinifies separately, and produces cuvees from their best plots. We were fortunate to spend the morning with Denis, the Director of the Co-op, in the vineyards, tasting the grapes straight from the vine, and comparing the ripeness of the various plots and vines. It really serves to show how the slightest difference in vineyard location – on the slope or on the plateau, south-east or south-west facing – can have such an impact on when and how well the grapes eventually ripen. The other unavoidable aspect of life in the Rhone, other than the wind, is the food –and we had to contend with a lot of it. Our first lunch set the scene for the rest of the trip perfectly. We sat outside a tiny restaurant, with the menu on a chalkboard and surrounded by broken down tractors, shaded from the midday sun. The food was fresh, local and delicious- brandade of cod with roasted peppers, sautéed sweetbreads and some great local cheese, all washed down with some “tastings” from nearby wineries. It was going to be a long few days…. That afternoon, with any lingering memories of our early start nicely washed away, we headed north-east, through Avignon to the tiny village of Gigondas, one of the prettiest wine villages you are likely to see. We were here to meet Thierry from Domaine la Bouïssiere, an outstanding producer with vineyards in both Gigondas and Vacqueyras. His Gigondas is a master class in elegant Southern Rhone – 70% Grenache and 30% Syrah from wind ravaged vineyards 350m up the side of the hills of Montmirail. He also owns 5 hectares in Beaumes de Venise, an area long known for sweet wines but with its own appellation for reds. The wine he produces there is sold to a Co-op, but shows wonderful potential –a fresh, vibrant and juicy red worthy of its AC status. Dinner that evening was at a beautiful little restaurant in Avignon, in a tranquil, candle-lit courtyard- all terribly romantic – and consisted of truffles, duck and lots of old Chateauneuf-du-Pape. Just to get us in the right frame of mind for the morning……. Out of bed and in the car at 9.00 am as promised  and we headed off to Domaine de la Janasse. This Domaine is undoubtedly one of the finest now operating in Chateauneuf-du-Pape, and has long been a favourite in ely. 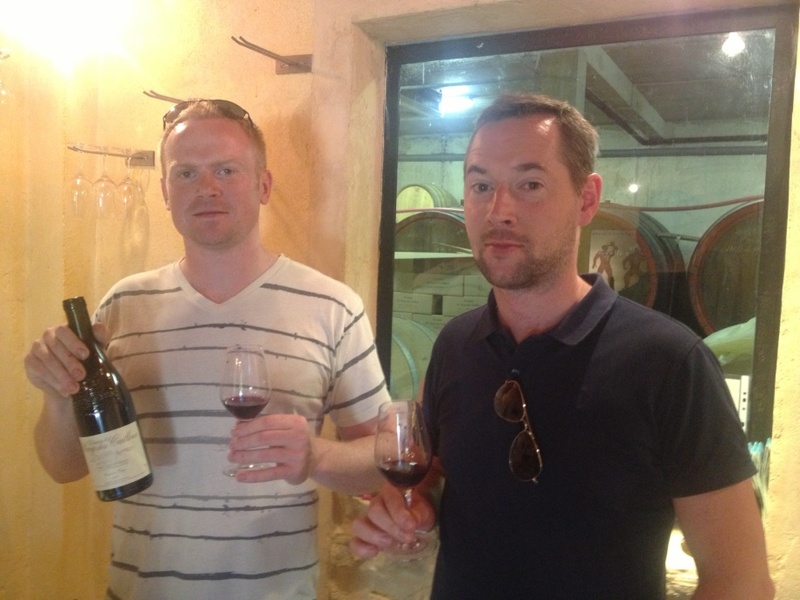 They produce everything from Vin de Pays to old vine Chateauneuf-du Pape. Everything in the range we tasted was outstanding- probably the most consistently impressive of all of the wineries we visited. The 2011 Cote du Rhone was superb- the peppery, savouriness was perfectly balanced by pure, clean, dark fruit. The Chateauneuf Cuvee prestige white – 70% Roussane – was wonderfully rich and with an almost Meursault-like nuttiness. There are 3 variations on the red Chateauneuf – a Vieilles Vignes, the ‘Chaupin’ – 100% Grenache- both of which were superb, but the standout for me was the Cuvee Tradition. Put simply, it reminds me of why Chateauneuf-du-Pape is held in such high esteem. A blend of 80% Grenache with 10% each of Syrah and Mourvédre, its defining characteristics are elegance, purity and concentration. There are more famous names and more expensive wines produced in this region, but none match Janasse for quality, consistency and value. These wines should probably be more expensive – and that’s not something you’ll hear me say very often! How do you follow a tasting like that? We went to the village of Cairanne, to meet with Domaine Alary, another long-time ely favourite. Over the years we have listed his Cote du Rhone, the ‘La Brunotte’, la Font d’Estévenas, Cuvee Jean de Verde and Le Gerbaude, and they are just the ones we remember. The tasting confirmed two things – 1, that we’ve been right all these years- all of his wines are imbued with a softness which makes them effortlessly drinkable –and 2, that 2011 in the Southern Rhone is, as of yet, an unheralded star! There is a purity of fruit and vibrant freshness running through all of the wines that teases the palate…..and makes you ready for lunch. However, we had work to do, and a 2.5 hour lunch is plenty long enough when you’re on the clock. Domaine le Sang des Cailloux, one of the most respected properties in Vacqueyras was taken over in 1990 by Serge Ferigoule. Serge is one of those characters who make the world of wine even more fun than it already is, in trademark blue overalls and sporting the most remarkable handlebar moustache. As it turned out, Serge’s English was limited, and myself and Ronan’s French, while sober anyway, was fairly limited as well so the ever charming Marie-Carmen came to the rescue. 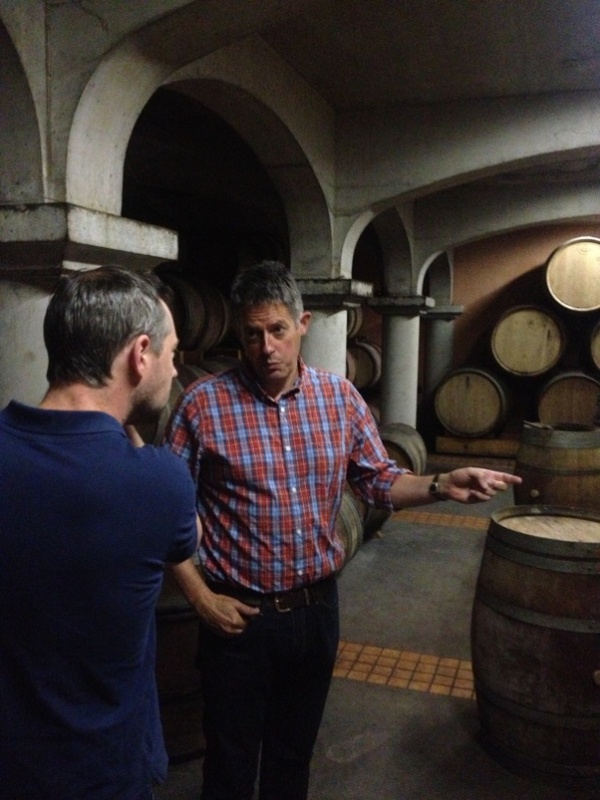 We started by tasting from the barrels – very young wines, not yet bottled. This can be one of the most difficult aspects of wine tasting- trying to see past the immature traits in the wine – harsh tannins, imposing wood influence or astringency –and see the potential qualities in the wine. It’s not always easy, and it takes practice. And practice we did! It wasn’t necessary for these wines though – even in the barrel the quality shone bright – lovely fresh yet intense fruit, with the beginnings of a spicy edge coming through on the finish. We could have drunk them straight from the barrel, but Marie-Carmen insisted we taste a few bottles too. It can be hard to just choose one wine as a favourite, so I’ll just say that the 2010 Sang de Cailloux ‘Cuvee Floureto’ deserves your utmost attention. Another day’s work done, we headed for the hills – well, a tiny village called La Begude de Mazenc, about 20kms east of Montelimar, and our home for the night – Hotel Le Jabron. The hotel is owned by Nathalie & Julien Hennebert, old friends of ours who are fondly remembered by everyone in the restaurant business in Dublin. Natalie was head Sommelier in Chapter One and then ran the Louis Abrouze wine shop on Lesson Street, while Julien was Sommelier in both Thornton’s and Pearl Brasserie. They moved back to France several years ago and took over this charming hotel and restaurant. They welcomed us in the best possible way – with a cold glass of beer! Ironically, after a period of sustained wine tasting, you develop an intense appreciation for cold beer, and as two former sommeliers, they understood this. We sat outside the hotel, drank some beers, made some friends and prepared ourselves for dinner. The food is outstanding – snails in garlic, caillette –a local pork speciality- foie gras, beef, cheese and possibly more foie gras. The wine list –as you’d expect- is exceptional, but with the sort of prices that make you wonder why we don’t all up and move to France. One of the most interesting wines we tasted over dinner was a little Cotes du Rhone called Les Deux Col 2012 – made by none other than Professor Tyrrell himself! 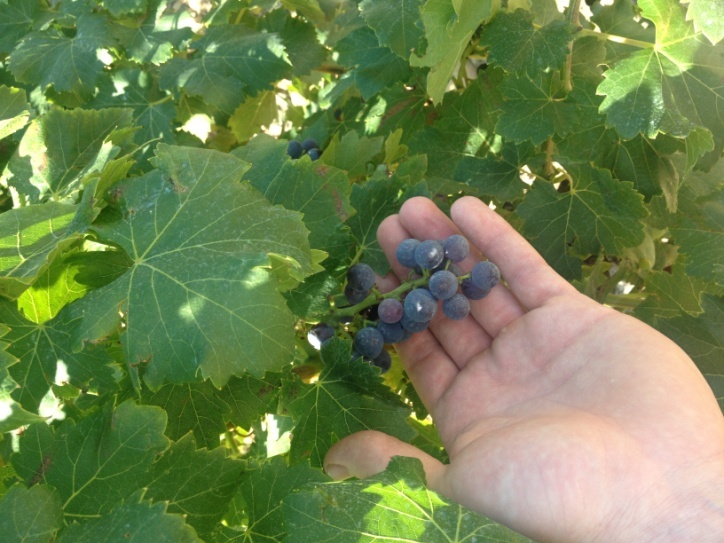 Simon sources the fruit from some of the best growers in the region and then blends and vinifies the wine himself. The result is a classic Cotes du Rhone, full of flavour yet wonderfully soft, and perfect with food- you can expect to see it in ely soon.